Place the tomatoes and chiles on a sheet pan and under the broiler, or on an already heated comal, griddle or skillet set over medium heat. Roast or char for 10 minutes, flipping in between, until completely charred, cooked and mushy. Place the chiles in a plastic bag, close tightly and let them sweat. After 10 to 15 minutes, peel off their skin under a thin stream of water. Then make a slit down the sides of the chiles with a knife and remove the seeds. Cut them into horizontal slices. In the jar of a blender, place the charred tomatoes and their juices, 1 of the cleaned banana peppers, and the salt. Pulse for only a few seconds, until coarse, rustic and chunky (not a smooth puree). Heat the oil in a large skillet or casserole set over medium-high heat. Once hot, add the salsa and incorporate the remaining slices of chile. Cook for 5 to 6 minutes. Meanwhile, beat the eggs in 2 batches of 6 eggs each and season with salt. Heat one teaspoon oil in a non-stick skillet set over medium-high heat. Once hot, add the first batch of 6 scrambled eggs and cook as you would a messy omelet. Once cooked but still tender, about 2 to 3 minutes later, scrape onto casserole with salsa. Repeat with the second batch of eggs. 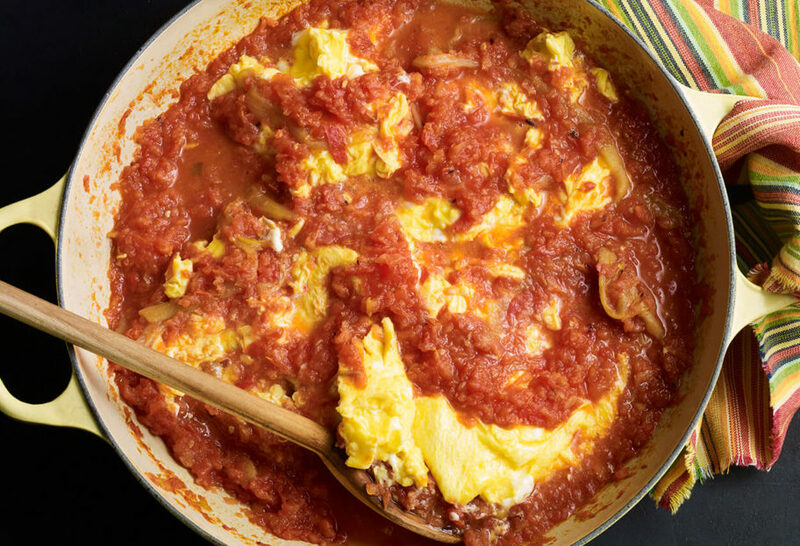 Cover the eggs with the salsa and serve. So glad you both loved them, Jose. I got up at 6am today – yes, a Sunday to make everything from this episode. What a wonderful meal…I learned that the sauce for these eggs and the beans can be made ahead of time and reading through I also can make the second rising for the rolls in the refrigerator over night….which I recommend. Good thing I love to cook, because it took me about 5 hours – mostly the rolls and not knowing what I was doing. Giggle! I will definitely make everything again. Thank you Pati – I love your show, cookbooks and mostly you! Sounds like a good Sunday to me, Rita 🙂 I hope you have lots more fun in the kitchen! Looks so good. Can’t wait til I can cook!!! My husband and I watch your show often and have made many of your recipes. This one is now made weekly, it is so good and easy to make. Love it! Oh that’s awesome, Susan! Thanks for sharing. I watched now i,m ready to start back doing what me and my bestie love to do COOK!!!!! Awesome…have fun in the kitchen, Karen! I just watched this episode and I can’t wait to make this! Me fascina tu programa. Gracias por mostrar al mundo las bellezas de Mexico. Where do you buy Bannana Chile’s or chiles de aqua? Im in Southern California Los Angeles area! I saw this on your show and had to make it today, for thanksgiving breakfast. It was a little too spicy for my mama, but perfect for me and my sister and brother in law. Is there another pepper I can substitute that’s less spicy? Love you pati! You can use less chiles or jalapeños have a similar flavor to banana peppers with less spice. Sounds great. I’ll try this as soon as I get soon eggs from my free range egg source. Sounds too good to do with supermarket eggs. Thanks for the recipe. I miss authentic Mexican food. I moved away from Las Cruces, New Mexico back in the late 70s. I hope you enjoy the eggs, JC!